Act in English with Théo-Théâtre 2010-03-30 http://blog.paris15.fr/2010/03/act-in-english-with-theo-theatre.html Dear English-speaking readers, today Paris15 is going to speak in English, insofar as Paris15 can speak, that is. Actually, this is not the first time that Paris15 has been speaking English, as we had previously published an article about a play in English at the Monfort. Anyway, today Paris15 would like to inform you that you can act and play in English, not at the Monfort but at the Théo-Théâtre this time. 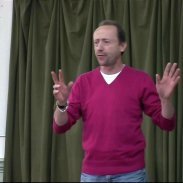 The man on the picture, François Teyssier, is organising an exciting Acting Workshop in English, and Paris15 really likes the idea. We therefore advise you to have a close look at the details of the Workshop... or even to participate! The creed is Come Along, Have Fun and Enjoy Yourself. The goals of the session are simple and clear: to be able to speak in public in English and to improve your fluency in English. The programme of the 2-day session is the following: (1) Practicing acting techniques : body and voice warm up, energy, focus, trusting other people, improvising and playing; (2) Creating a Story; (3) The story, creation and rehearsal and finally... (4) Performing in public! You will eventually be acting on the very stage of the Théo-Théâtre, which certainly represents an unforgetable experience!